I never really devoted the required time or effort to learn to free hand sharpen chisels and plane irons. I feebly tried a few times but it never really worked well for me. Over the years, I’ve seen and read about the contests between the hand sharpening experts and the honing guide users pretty much resulting in a sharpness draw, with the free hand approach saving time. I never realized however how much extra time the honing guide approach took. I started sharpening my planes and chisels 25 or so years ago with a Rockler sharpening kit which included a honing guide, a few different grit steel “stones” and a few oil stones. I guess it worked ok till I took a sharpening workshop a few years later. That’s when I realized what really sharp was. I bought a Tormek system, some Japanese water stones and continued using the Rockler honing guide for a few more years. Somewhere along the way I upgraded my honing guide to the Lee Valley Mark II It made a very big difference in the sharpness consistency of my edge tools. I also added the narrow chisel MKII and the camber roller as well as the Woodworkers set of Shapton Stones ( I really like them Shapton Stones). About a year ago I added a 500 grit Shapton stone and stopped using the Tormek, I have been quite happy with the results from that set up for a few years now. The only problem I was having was that my tools were often dull since it took so much time and fiddling to re-sharpen/re-hone with the MK II set up I often waited till the tools performance fell way off before I sharpened them. At one point, I took my sharpening kit and all my plane irons and chisels on vacation spending hours getting them all nice and sharp. I think that was the only time in 25 years all my planes and chisels were sharp at the same time! Well, a few weeks ago the roller on my MKII rusted solid, resulting in the brass roller getting flattened on one side and sounding like a freight train. I ordered a replacement axel and roller but while I was waiting for them to arrive, I found the Lie Neilson honing guide on line. My initial reaction was that It couldn’t possibly be worth $125.00, nor did I believe it could perform any better than the MKII setup I had! But, the more I researched it the more I considered it a possibility. Long story short It arrived yesterday. This tool, like most of Lie Nielson’s products is first rate, nicely machined and designed. Polished Stainless Steel and Brass (no rust) The jaws hold the tool tightly with simple finger pressure on the clamping screw. Holding the guide during use feels more natural and solid that the MKII to me. I quickly built the angle guide they recommend and started sharpening. You free hand guys may still get sharp more quickly than I do, but I think not that much more and I’m pretty sure you won’t get your tools any sharper than I get mine. I was able to sharpen, and hone five chisels in what seemed like no time at all. Faster I think than I could have done only one chisel with the MKII with all its fiddling about with two knurled nuts, keeping the clamp even, tightening the clamp with pliers so the blade wouldn’t slide around during use, aligning the fence setting……removing the fence, and on and on. The Lie Neilson honing guide and angle jig are a star performance combination that amazes’ me not only how fast it goes but the consistency of the results. Getting the tool is perfectly square to the stone, setting the angle and tightening down the jaws literally takes a few seconds, maybe two. I only got the standard jaws and they worked perfectly on all my Lie Neilson chisels except the 1/8” one which requires a special accessory set of jaws for its smaller size. My thinking is that I will continue using the MKII chisel kit for that one but I can easily see myself springing for the $25.00 upgrade in the future. This set up might not make my tools any sharper than the MKII but it will for sure keep them sharper with ease and speed. I haven’t sharpened or honed any plane irons yet but interestingly I’m looking forward to getting on with that. In summary, get this honing guide, it’s a top tool that will last a really long time and woodworking with sharp tools all the time is going to be way more satisfying. This thing works so well that I can even imagine a few die hard free hand folks switching over. Seriously! Nice write-up Ken, I have one, haven’t used it yet! Ken, I have had a similar experience as you with the MKII. I only have the standard roller though. Same thing with letting the blades go too long between sharpening. Tried the freehand route with mixed success also. Bought and used a Woodriiver honing guide to try since they are so inexpensive. That works quite well and is so much faster to use then the MKII. Not to knock the MKII, used one for quite a while. So, just yesterday I ordered the Lie-Nielsen one and can’t wait for it to come. I bought the long jaw set to use on spokeshave blades. The cost seems high for what it is, but Lei-Nielsen tools are for a lifetime so I think this should be the last sharpening accessory I ever buy. 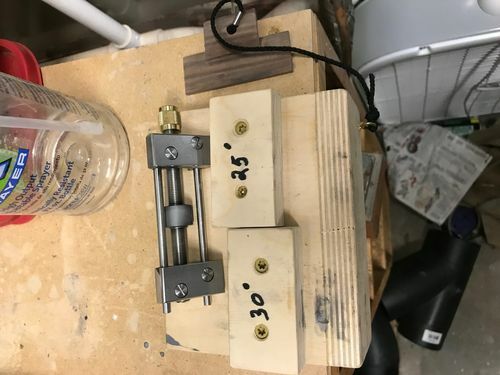 Could you show what your angle setup jig looks like? Nice, Ken. That looks handy. Got to get off my duff and make one of those. Beats grabbing a ruler all the time. Nice review Ken. I agree with you. I’ve had mine about a year know and it’s worth every penny. Over the years I have tried all of the popular honing guides, including the authentic Eclipse jig that was made in England, and the array of Lee Valley jigs. I have settled on the Lie-Nielsen, which takes the Eclipse design to a whole other level of utility and quality of build. The fact that it is completely water cleanable is just one great feature. If I was to pick the single best feature, it would be the repeatability of setting the bevel angle desired. This guide was designed for use with LN tools. It will handle straight, flat blades from other make of planes, but not all chisel brands will work in the LN guide. Lie-Nielsen is pretty clear about this in their catalog description, so those who complain about the guide not holding all brands of tools are fairly forewarned. This is good to know. Learning how to sharpen chisels and plane blades have been on my todo list for a long time. I’ve considered getting the cheaper honing guides but I think I’ll wait to get something that will last.